Using a radio telescope with frequencies just above those of commercial FM radio stations, a European team of astronomers has obtained the most sensitive image of a galaxy below 1 GHz. 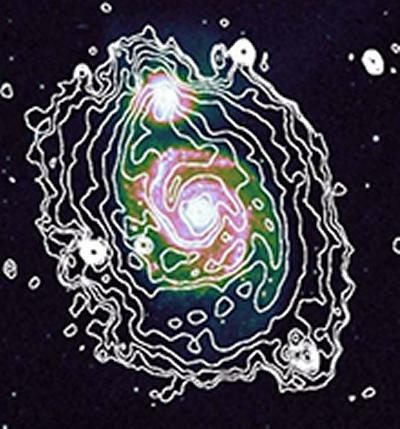 The team viewed the “Whirlpool Galaxy” Messier 51 (M51), about 30 million light years away, with the Low Frequency Array (LOFAR) radio telescope in the frequency range 115-175 MHz, just above the normal commercial FM radio frequency band of 88-108 MHz. These results are the first LOFAR observations of a nearby galaxy. LOFAR consists of 38 stations in the Netherlands, six stations in Germany and one station each in the UK, France and Sweden. The signals from all stations are then combined in a powerful computing cluster located at the University of Groningen in the Netherlands. Radio astronomy shows two crucial components of galaxies that are invisible to optical telescopes – cosmic ray electrons and magnetic fields – which play an important role in the stability and evolution of galaxies. With LOFAR’s high sensitivity, the astronomers detected electrons and magnetic fields in the spiral arms and extended disc of M51, 40,000 light years away from the galaxy’s centre – much further out than had ever been traced before. The research, which is published in the journal Astronomy & Astrophysics, was led by David Mulcahy from the University of Southampton’s Astronomy Group. It was conducted for his PhD work at the Max Planck Institute for Radio Astronomy. For many decades, radio astronomy has been unable to explore low frequencies below 300 MHz because the ionosphere around the earth acts as a barrier of low-frequency radio waves. The only observations were of poor resolution and no details could be made out. “This opens a new window to the Universe where we do not know what galaxies will look like,” says Rainer Beck from the Max Planck Institute of Radio Astronomy, who supervised David’s PhD project. “Maybe we will see how galaxies are magnetically connected to intergalactic space. This is a key experiment in preparation for the planned Square Kilometre Array (SKA) that should tell us how cosmic magnetic fields are generated,” he adds.